Pre-K Letter Matching Activities: Teach Your Preschoolers to Make Letter Pets! To prepare ahead of time either save the Letter Pets image at the top of this article or create some images of your own. 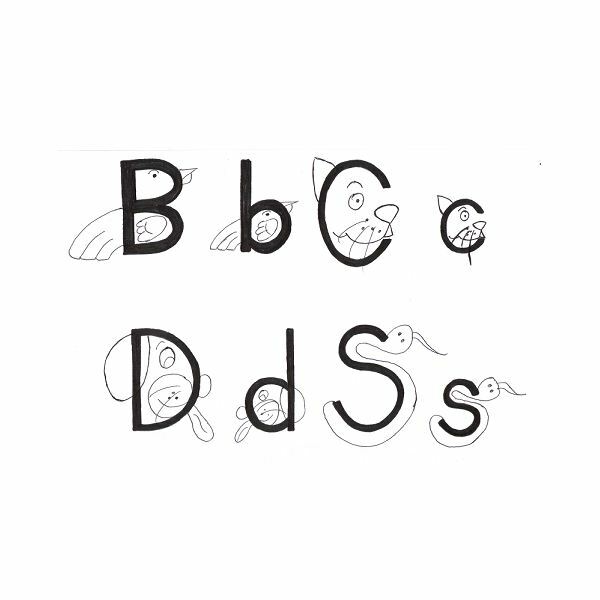 The example provides letter pets for both uppercase and lowercase forms for B, C, D and S. A sheet with smaller versions of the letter pets may be created for matching cards. Also, full-size letters pages can be made by blowing up the images to use for coloring and classroom discussion activities. To create cards for letter matching activities, cut out the smaller images and glue them to sheets of card stock. You may choose to make multiple sets of these so each child has an individual set of cards. Laminating the matching cards is an optional last step. The letter pets images may be used for several different letter matching activities. These activities should be used over the course of a week. 1. Begin by using the sheets of full-size letter pets to teach and discuss each letter. Focus on one letter each day. Point out how the animal’s name also begins with the same sound. Also, note how both the letter and the animal each have a parent and a baby which belong together and make the same sounds. 3. Review the letters, animals and the sounds each day. Once you’ve covered a few letters of the alphabet, engage the kids in a fun game of matching the baby letters and animals with their parents. 4. Another fun letter matching activity the letter pets may be used for is an interactive classroom game. Use the same images as for the matching games but glue each one to a craft stick (create a handle) before adding the backing. Give each student a complete set of the cards. Stand in front of the class and call out a letter or its sound. Each child should search for the matching card and hold it up for you to see. These activities are only a few of the ways letter pets may be used to teach and entertain children. Let your imagination run free and find other ways to incorporate them into your preschool pet lessons and activities. This is a series of articles with lessons, crafts and activities to teach preschool children about pets. It includes science, math, music, literacy and art activities.